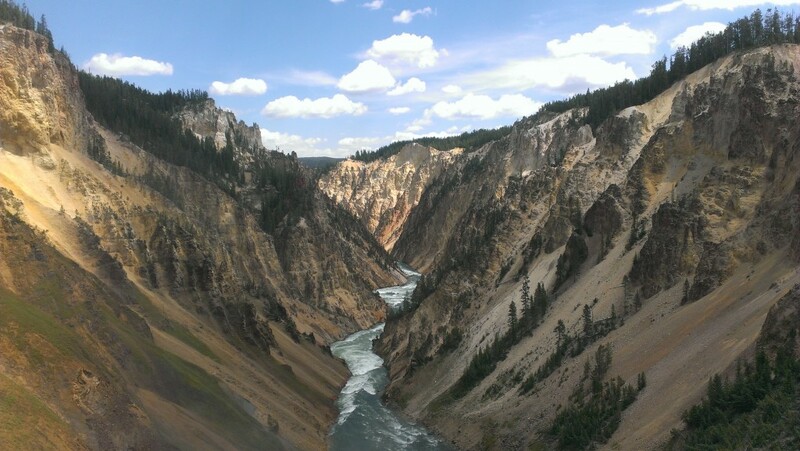 The Yellowstone river running through the park is very impressive, and it has carved out a massive canyon with its powerful flow of water. The canyon is 20 miles long, with a depth of 800-1200 feet, and a width of 1500 to 4000 feet. Grand Canyon of the Yellowstone National Park is definitely worth visiting even if you only have a couple of days in the park. 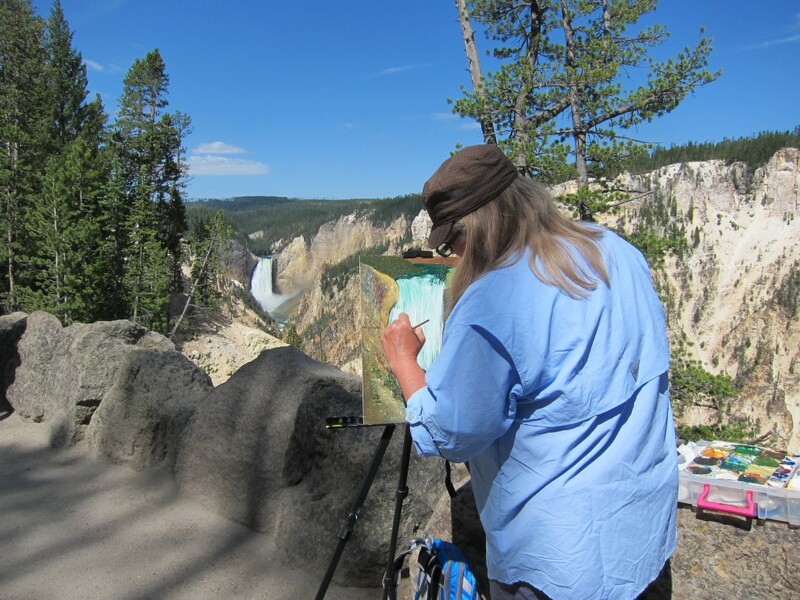 In that area make sure you see both the Upper Falls and the Lower Falls, and stop by Artist’s Point to see one of the most often painted scenes in the USA. If you have time and energy, take a short walk on the South Rim of the canyon to appreciate the massive size of the canyon. The canyon area is set up so it is easy to get around. There is a North Rim and a South Rim of the canyon, and they are less than a 5 minute drive from each other. (Well, you can hike to a bridge that takes you between the two, but I personally think that is too much time spent hiking and not enough time spent seeing things). Make sure you check out both the North Rim and the South Rim for different views of the canyon and the Upper and Lower waterfalls. Lower Falls. Yes, that is snow in July! 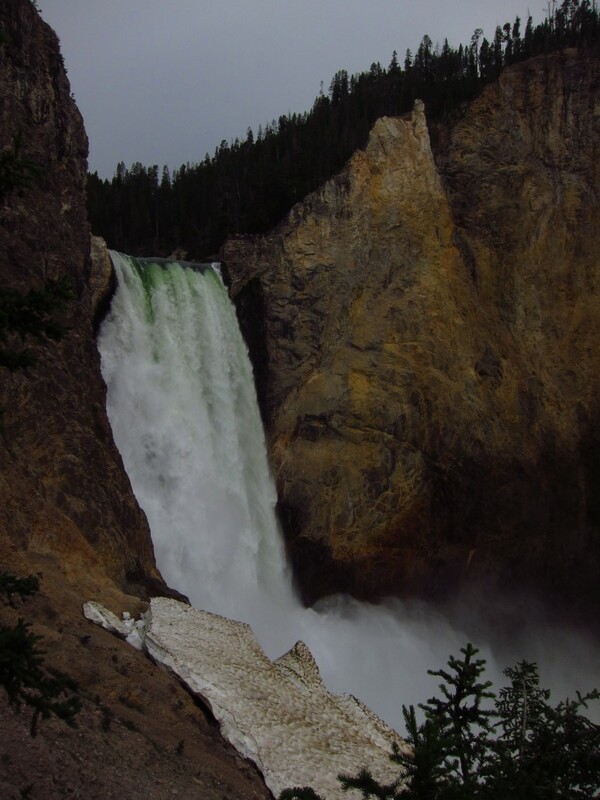 The Lower Falls are particularly impressive because over 37,000 gallons of water flow over the falls every second. EVERY SECOND! That’s insane. I love that you can see the falls from every angle to appreciate their power by taking all the little switch back trails to each Lookout Point (warning: each trail is several hundred feet in elevation and keep in mind that you are 8000 feet above sea level so breathing will be hard). If you can’t make it up and down all of the trails, then the two I recommend most are Uncle Tom’s Trail on the South Rim (308 stairs + more switchbacks), and the Brink of the Lower Falls on the North Rim (a huge number of switchbacks, we lost count). Keep an eye out for the amazing yet subtle colors of the canyon scenery. Some of the sandy canyon walls are several different shades ranging from yellow to orange to pink. And the river itself is a beautiful emerald green color. 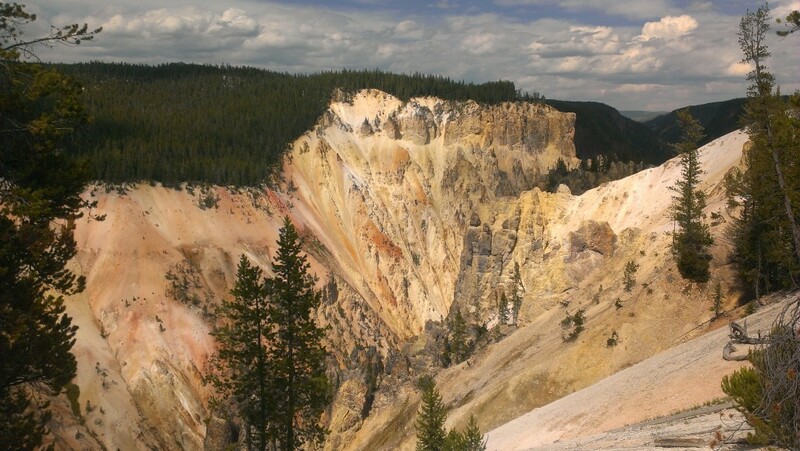 The most important tip for visiting the Grand Canyon of Yellowstone National Park? Make sure you bring your binoculars! We saw an Osprey nest on one of the cliffs in the distance at the start of the Red Rock Point trail. 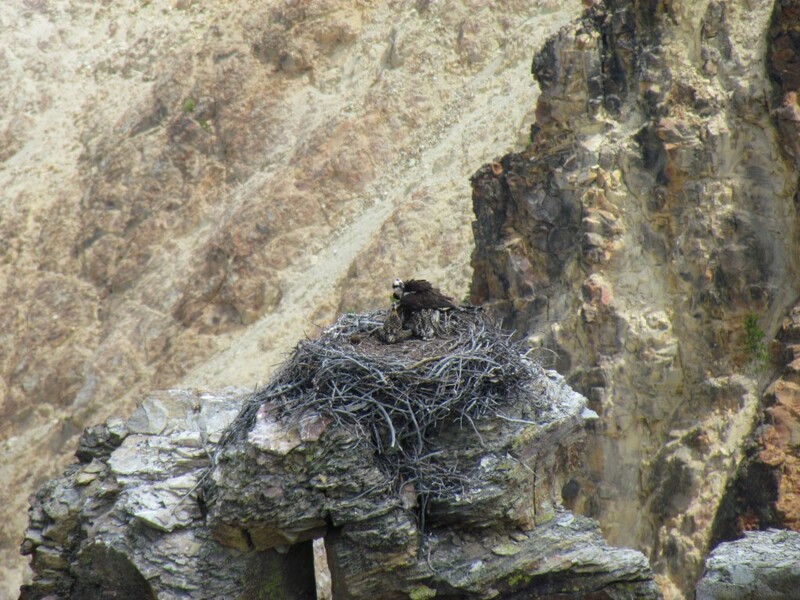 When we were there we saw two osprey chicks in the nest being fed by their momma. It is crazy to think that the nest you see from far away can be as wide as 5 feet in diameter! The other thing to look for in that area are hoof prints that you can see on the North Rim from the edge of the South Rim. It seems like it would be impossible for any animal to traverse that terrain because it looks sandy and super steep, but there are definitely paths formed by hoof prints. I wonder what animal goes there? Osprey nest, thanks to Aldo’s 35x optical zoom. 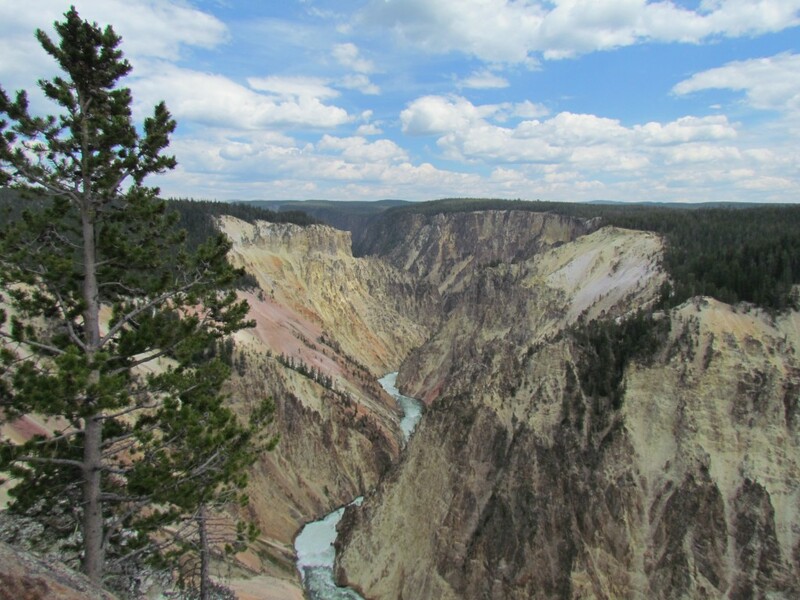 We really enjoyed seeing the Grand Canyon of Yellowstone, and I can’t wait until we visit the real Grand Canyon in Arizona!